The term EPS70 relates to expanded polystyrene which has a compressive strength of 70 kPa. The sheets comprise of expandable beads of polystyrene which are pre-foamed and fused together in a steam-heated mould under pressure. • EPS is rot proof, unaffected by bacteria, moulds or fungi and is non-toxic, non irritant and odourless. It also has no nutrient value to insects and vermin. EPS is a combustible material but providing it is installed correctly in accordance with the manufacturers’ instructions, it will not prevent any undue fire hazard. 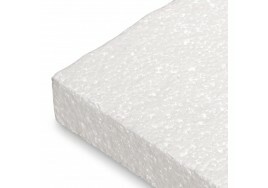 Other higher density grades of expanded polystyrene can be sourced on request. Other than EPS70, grades available are EPS100, EPS150, EPS200, EPS250, EPS300, EPS350, EPS400, EPS450 and EPS500. Some of these will have minimum order requirements. Please contact our helpful sales team on 01274 602367 if you would like to know more. PRICES ARE FOR FULL PACK QUANTITIES AND CANNOT BE SPLIT. EPS70 insulation sheets comprise of expandable beads of polystyrene which are pre-foamed and fused t..